A new version of ygopro has been released! New features include: Cards from Structure Deck Assault of the Flame King, new anime cards, bug fixes, translation updates and more. Aw yiss, time to upgrade our decks. Thanks! Thanks Percy. What about an option to remove the limit of 60 cards in a deck ? I mean just for local duel. If it is just for local duel, there won't have any problem between players. Please, do it. Somme people told me that just two parameters must be changed (put other number than 60 on the lines 81 and 130 in the file "deck_manager.cpp" in folder "gframe" The only problem is to recompilate the program after, which need lots of thing that you are the only to have. Can you do it please ? 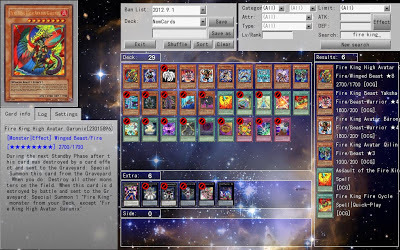 Percy Thanks for the update of YGOpro, if you can pass the updated version for the Mac OS for a friend of mine, please. Is it just me or what because i cant download it. an ad that says download or a download button that tells me it's downloading DFH Download manager i dont know where to download it is it still even a .7-zip file anymore so that i can just open with Winrar? [[Is it just me or what because i cant download it. an ad that says download or a download button that tells me it's downloading DFH Download manager i dont know where to download it is it still even a .7-zip file anymore so that i can just open with Winrar?]] Download it without DFH Download manager!! Simply unselected this option and you are ok!! i hope i help a little!! Hi, I have version v2 102F and want to activate the skin without making it look bad. Is there anything I can install DirectX or drivers to make it look good? i already posted in the forum about the bug regarding Deep Sweeper (seems an easy fix), but this means i cannot play my actual deck. New version is defeat in cards set list Abyss Rising, Only OCG no TCG for games. Thanks for Update. i can set card in game ? you can send this following cards ? When I normal summon Galaxy Knight while I have 2 or more face-up Galaxy or Photon monsters on the field, the game won't allow me to normal summon him without tributes and I'm forced to offer my monsters instead. I can still normal summon him without any tributes if I have less than 2 monsters on the field. Please fix this in the next version. My main deck is Photon Dragon and I'm being crippled by this error. "Unable to connect to host"
It's getting very old. I can't even play a single game. Excuse my ignorance, but I also play the Yu-Gi-Oh! 5Ds World Championship 2011 for NDS. I noticed that the NDS when the card field "Ancient Forest" is active and the cardholder field attacks with a "Gladiator Beast" at the end of "BP", first you can activate the effect of "Gladiator Beast" and then to "Ancient Forest "being active. But in YGOPro, this only happens if the "Ancient Forest" is not on the same side of the field "Gladiator Beast" Forward. When both are on the same side of the field, "Ancient Forest" activates its effect first, thus destroying the "Gladiator Beast" before he could activate its effect. I wonder what's wrong or if it is simply a matter of updating the rule? Because can I no longer choose the order of the chain between "Anciente Forest" and "Gladiator Beast"? Really? Because I've had issues with neither. I understand it's the holidays and I do apologise if this seems rude, but can we expect an update in the near future with some of the cards that have been released/announced lately (Premium Pack 15, Jump Festa 2012, Galaxy-Eyes Tachyon Dragon, etc)? There will be an update soon. umm. so where is cercyon, sombres and the new cards then? umm... so where are the new cards cercyon, sombres etc. Sorry if this is repost, but Speed Spell - Heavy Storm destroy Speed World 2 and give me error message. Apologies if this question seems repetitive, but will we be seeing cards from Lord of the Tachyon Galaxy and from Premium Pack 15, along with Flashing Carat Dragon? -- This one is very minor, but "Roulette Barrel"'s picture reads "Life-Absorbing Machine" as the name of the card. -- (I think this one is a bug). Chaining, for instance, "Offerings to the Doomed" to "Lava Golem"'s effect during your Standby Phase causes your opponent to lose 1000 Life Points when the card goes to your opponent's Graveyard. i special summon it, use its effect and return it to hand, then normal summon it; now i can't activate its effect of returning it to hand again. Effect: 1 tuner monster + 1 or more Dragon-Type Non-Tuner Monsters The turn this card is Synchro Summoned successfully, this card cannot be affected for Spell and Trap cards effects. Once per turn, you can tribute one monster you control, except this card; You can Synchro Summon one Level 8 or lower Dragon-Type monster from your Extra Deck. If the Synchro Summoned Monsters is removed from play, removed this card from play. This card cannot attack in the same turn that activated this effect. Please add Fishborg Archer. Thank you for your awesome work :). why old replays don't work with the new versions of the game ?